Thanks to Principal Race Officer Peter Reggio and his world famous wind-seeking nose, one race was held today, on an otherwise wind-less Hayling Bay. Team Nika started with a 12-point advantage in the 11 boat fleet, so had all but won the regatta before this. As tactician Ed Baird explained: "The only way we couldn't win was if Team Aqua won and we had a collision and got penalty points." Following a 'keep out of harm's way' approach', Team Nika started on her own at the committee boat and headed right where Baird said they had spotted a cloud showing potential. "We went for that, got a nice 15° right shift that no one else did." Leading around the top mark, she sailed into decreasing pressure down the run causing the boats behind to close. Team Nika ultimately ended up finishing second giving her a massive 14-point victory: This year's first two RC44 regattas were won by just two and three points. "We definitely sailed well and the score shows it," enthused Prosikhin. "I believe we won because we decided to relax and enjoy it. I put too much pressure on Ed [Baird] before. We also didn't make so many mistakes, although we still had some problems…" Sadly, after Team Nika's disappointing non-discardable result at the RC44 Sotogrande World Championship, Prosikhin feels it will be some time before his boat again sports the 'golden wheels', the RC44's equivalent of the Tour de France's 'yellow jersey'. Boat of the day was unquestionably Alexander Novoselov and Vladimir Sokolov's Katusha, helmed here by Sokolov. After starting well, close to the pin, Katusha found herself caught in traffic and after further mistakes was last approaching the top mark. An early gybe saw her key into more pressure on the run pulling her up to fifth. Rounding the leeward gate coincided with a big right shift and she hung on to the unflavoured tack out to the right longer than anyone else, enabling her to catch Team Nika on the long port tack up to the top mark. In a three-way lunge for the line alongside Team Nika and Artemis Racing Youth, Katusha just managed to take the win. "It was not an easy race, but it was a good fight, good fun," said Katusha's relieved tactician, Andy Horton. Sokolov was also pleased. Two and a half years since he and his partner bought Katusha, this was their first podium finish. "It has taken us that long to build a team that works well, without any mistakes, like a Swiss watch. I am proud of the crew and Andy Horton, who is a magician. We were losing today's race and we finally won it – just because of them." The real battle took place in the mid-fleet where just seven points separated seven boats. A last place finish today for Artemis Racing, after she was becalmed interminably by the leeward gate, saw her drop from fourth to seventh overall. 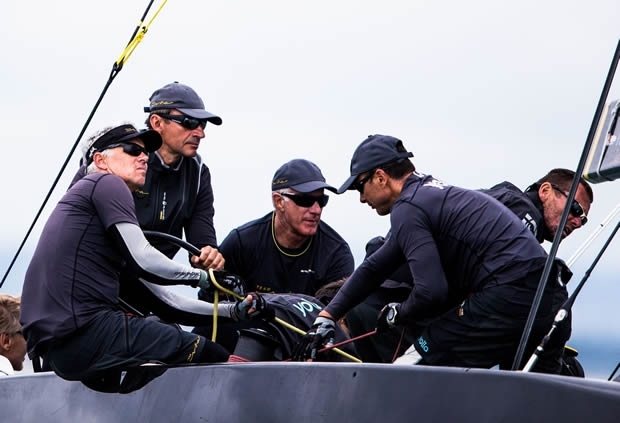 Conversely, a fifth place today was enough for Igor Lah's Team CEEREF, overall championship leader going into the RC44 Portsmouth Cup, to rise two places to sixth. However this wasn't enough for the Slovenian team to retain the 'golden wheels', which have returned to Chris Bake's Team Aqua, which now holds the lead by two points in the 2016 annual championship. Team Aqua finished second at the RC44 Portsmouth Cup. "It didn't feel like we deserved that," admitted Bake at the prizegiving, held on the Flight Deck, the top floor of Land Rover BAR's impressive America's Cup base in Old Portsmouth. "It was a tough week for all of us - challenging wind, challenging tide and a little bit of weather to deal with. It was good sailing and I am proud of what the team has done again." Bake was pleased to recover 'his' golden wheels, and was proud to have hosted the UK event. "It's a shame today we didn't get a more sailing in, but I think that the overall set-up was good and I'm happy with how it went. It's been a decent week." Last night, the 'RC44 owner's dinner' was held in the unique setting of Lord Nelson's HMS Victory, in Portsmouth Historic Dockyard. Next up is the RC44 Cascais Cup to be held over 21-25 September.